As the global development community begins to implement the new Sustainable Development Goals, many look to the promise of integrated development approaches as a means to provide effective solutions to complex, multifaceted development challenges. The Uganda CC is a five-year USAID “Feed the Future” initiative, implemented by FHI 360 and partners. Starting in 2011, this program supports the Uganda Nutrition Action Plan, working across 15 districts to improve the nutrition and agricultural-based livelihoods of vulnerable populations. CC officers coordinate sector-specific partners to deliver a package of multisectoral interventions targeted for the specific needs of each community and household. 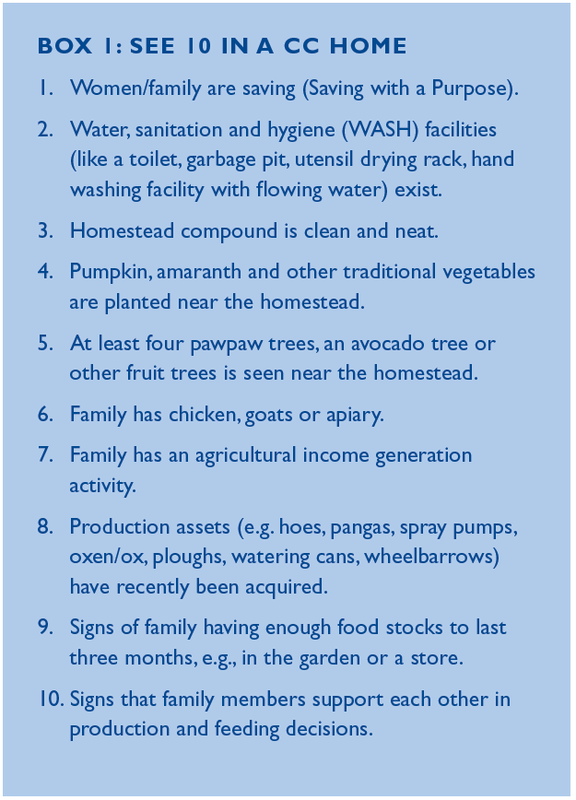 Household interventions promote 10 outputs. These promote gender equitable practices, strengthening household economics/livelihoods, improving agricultural production and variety and improving nutrition and general hygiene. Click here to view a larger version of the image. Integration is enabled by the program structure, organization, funding and monitoring and evaluation. CC works with community groups and learning sites, leveraging the group’s interest — such as agricultural pursuit — to convene and teach skills in the other project areas, including WASH and good health. The CC consortium includes specialists in agriculture, finance, and health/nutrition who contribute technical staff to a unified project management leadership team. Partners from different sectors plan activities together and use the same training materials, touching on multiple sectoral topics. They coordinate work with the government via district nutrition coordination committees, comprised of specialists from several different sectors. USAID’s Collaborating, Learning and Adapting framework is incorporated in the program where — through a modular approach of planning, learning, adapting and implementing — real-time data is used to continuously assess the efficacy of interventions and change courses if necessary. The program uses a fixed-price contract, where the implementers are paid based on achieving specific deliverables, without specifying their required activities. This allows CC flexibility to allocate resources in coordination with program learning and adaptation. USAID also provides a performance-based award fee where implementers that exceed expectations on deliverables receive additional payment. In 2008 CARE and WWF, encouraged by an angel investor, joined forces in coastal Mozambique to improve the livelihoods of vulnerable populations and protect the ecosystems on which they depend. Through this 10 year partnership, WWF and CARE staff are jointly organizing community associations to expand markets and income from fishing and farming, supporting marine sanctuaries in order to allow to fish stocks to rebound, training farmers in new techniques to increase productivity while protecting natural resources, and setting up gender-balanced natural resource committees to guide community land and resource use decisions. “As conservationists we take great care to incorporate people's’ needs into our work. I thought we were first rate, until we learned from real development experts,” Marcia Marsh said, WWF’s chief operating officer. As with the CC project, the alliance is structured to enable integration at multiple levels. The respective WWF and CARE Mozambique directors merged their coastal projects under a unified management structure with one project director, strategy and set of deliverables. The strategy includes both technical and policy-related interventions, with a joint approach to the Mozambique government, which now has its own newly integrated Ministry of Land, Environment and Development. And a global steering committee convenes each organization’s leadership to provide high-level strategic guidance, including a protocol on how to approach donors in a mutually supportive way. In order to collect evidence and test hypotheses, the alliance uses a Learning-to-Action Initiative framework to collect evidence. This also enables it to inform iterative program design and implementation and to scale learnings to other projects. 1. Partnership is a must. Generally no single organization can deliver all the technical interventions required in a multidimensional program. Find partners with complementary technical skills and collaboratively assess all the relevant dimensions impacting households and communities at the start. 2. Take time to co-design. These programs usually take a lot more time and coordination and new ways of thinking to implement than single-sector approaches. And this can be frustrating, burdensome and confusing to field staff. Engage staff in the design from the start and demonstrate how this approach helps them do their jobs better. 3. Allow flexibility and adaptive design. Intentionally designing, delivering and evaluating integrated projects is a complicated process and there is not a lot of data to guide how to do this most effectively. “The CLA approach and fixed-price contract plus award-fee funding mechanism — which allow us to focus on outcomes rather than pre-determined activities — provides the flexibility we need to experiment, learn what’s working, and adapt our approach as we go,” said Wendt. 4. Organize for integration at many levels. Both projects instituted mechanisms at multiple organizational layers to assure joint creation, ownership and accountability for delivering on the targets. This collaboration is reflected in everything from local management and training protocols to global approach to donors. While these lessons are insightful, they are still somewhat anecdotal. Both programs point to the need for better information to guide effective integrated development. To help fill this evidence gap, FHI 360 is dedicating $4 million through an FHI Foundation grant as part of its Clinton Global Initiative commitment to explore in what instances and how to combine efforts to produce an amplified impact in communities that are cost-effective. Given the complexity of development challenges, practitioners should consider applying integrated approaches, building upon the experience of successful models and designing and measuring their programs in a way that adds to the global intelligence on when and how best to integrate. How can an intentional, integrated approach to the design, delivery and evaluation of programs make an enduring difference in people’s lives? Devex, in partnership with FHI 360, aims to advance the global conversation on the promise offered by integrated development solutions through #IntegratedDev. Visit the campaign site and join the conversation using #IntegratedDev. With over 20 years of private sector and NGO experience, Jessica’s company Catalynics provides support for corporate sustainability, social responsibility, and sustainable development strategy, implementation, partnerships, stakeholder engagement and policy. She’s led programs at World Business Council for Sustainable Development, World Wildlife Fund, and International Paper.